The weather is hot and so are these mushrooms. Right off the grill. Right after a nice swim in the pool. Ideally, that is, as I have no pool to have a nice swim in, but I imagine that would be pretty great, now that we’re hitting the ridiculously high 110+ degree temps here in AZ. Whatever. I figure if I have to survive the heat, at least I can take it out on these stuffed mushrooms by giving them a good grilling session of their own. Besides, grilled things seem to go so nicely with a cold drink and a hot day, no? These scrumptious ‘shroomies are filled like little baskets of sorts, so they can fit your various tastes and moods, or can be made to order for your friends or family. Each one is recipied for a single mushroom, so it’s easy to make a single one, a variety of flavors, or a batch of one kind with a little recipe multiplication. Preheat your grill to about 350-400 degrees. Wash the mushrooms first, pat dry with a paper towel, and spray both sides with an olive oil cooking spray. Season with a little salt and pepper on both sides. Close the lid over mushrooms for about 2-4 minutes, until the toppings start to soften and cheese becomes melty. The bottom of the mushroom will get softer and develop some nice grill marks. Garnish with appropriate garnishes, and serve immediately! This Greek-style sweetie is a simply delicious way to get your pizza fix sans-crust, as well as the juiciest stuffed mushroom I have ever eaten. It's pretty sweet, dude. Sure, mushrooms are low-calorie and non-fat, and the toppings for this one are as healthy as they are tasty, but I thought this made a pretty good lunch, too. Like… it was filling. Kinda weird, right? Not really what I expected, but it was actually like eating a little pizza. Mix cherry tomatoes through seasonings together in a small bowl. Prepare Portabella as directed above, filling with the mixed toppings before finishing cooking. Everything should be heated through and deliciously juicy when ready! Serve immediately. 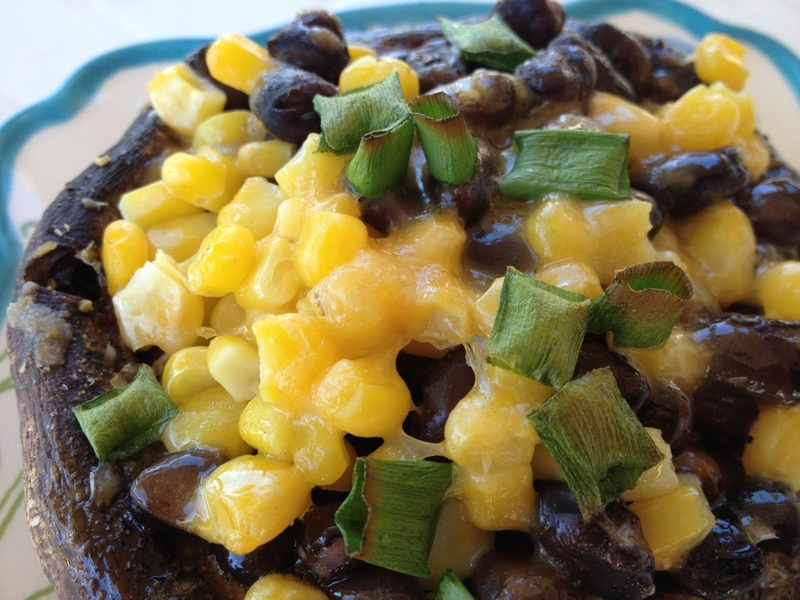 I decided to spice up this trio with a hot Mexican-style number – I consider spice as the spice of life, after all – featuring black beans, corn, and cheese. The melty, cheesy topping certainly makes my mouth water, anyway. However, the main draw for me is the spiciness of the seasonings and the salsa on top, while the mushroom provides the juicy base for the whole shebang. Like a mushroom burrito bowl. Combine corn, beans, green onion, and seasonings in a small bowl. 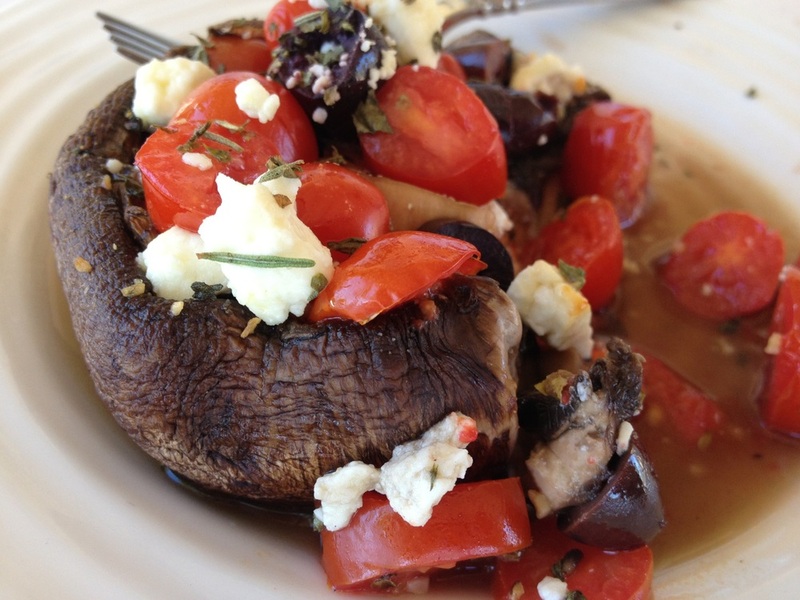 Prepare mushroom as directed above, and fill with the toppings when ready, adding cheese before replacing on the grill. When the mushroom is cooked and the cheese is nice and melted, top with a spoonful of salsa, and enjoy, pronto! 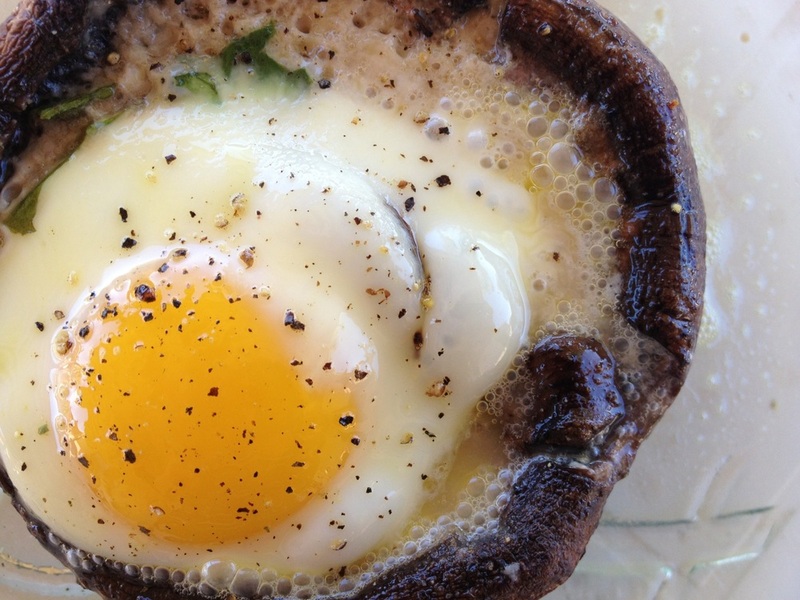 The egg in a Portabella was the idea that got me started on this stuffed ‘shroom project. I wanted to know if the egg would bake itself right into the little rivets in the mushroom cap. Oh, yes… it did. I think that this egg needs a bit more cooking than the grill can give it without the mushroom over-cooking first. I like to grill the hollow side of the mushroom first, fill it with the egg, yolk unbroken, and nuke it – yeah, in the microwave – for about 30-60 seconds, until I can see that the yolk has clouded to a desirable opaqueness. Blanket the eggy baby with wilted spinach, cheese, and a light sprinkling of more seasonings, if desired. Then I stick it back on the grill for the 2-4 minutes needed to cook the ‘shroom. Garnish with chopped green onion or chives. This one was really good – better than I expected with the egg-speriment! I can’t think of a more fun way to eat an egg.